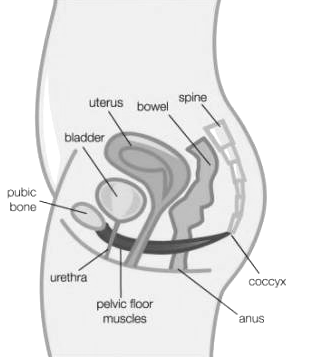 Pelvic floor muscles stretch from the pubic bone to the tail bone like a sling or hammock. Pelvic floor muscles work with the deep abdominal muscles, the back muscles and the diaphragm to support the spine and control the pressure inside the abdomen (diagram 1). These muscles play the most important role in bladder and bowel control, supporting pelvic organs and sexual function. What should I be doing for my pelvic floor muscles during pregnancy? Do your pelvic floor exercises! Pregnant woman are at risk of pelvic floor problems. It is safe to do pelvic floor muscle exercises while pregnant. Doing the exercises can improve urinary incontinence that occurs during pregnancy and help to reduce the dragging feeling. Research shows that up to 50% of people are doing pelvic floor muscle exercises incorrectly. Now that you are pregnant it is really important that you do them correctly and you do the pelvic floor muscle exercises well. Contract your pelvic floor muscles before you cough, sneeze, blow your nose and lift etc. Avoid heavy lifting and/or try to share the lifting load whenever possible. Eileen Lavis and Karen Burns who are both continence and pelvic floor physiotherapists can discuss this with you and can help you plan a safe exercise program. Do not overheat when exercising. Exercise at your own comfort level. Do not strain when opening your bowels and sit in the correct position to minimize pressure on pelvic floor. Correct, functional and regular pelvic floor exercises during and after pregnancy are essential to prevent pelvic floor difficulties. They may also help with your delivery and recovery after childbirth including after caesarean. We can help you to know if you are doing your pelvic floor exercises correctly and teach you to use your muscles functionally. To find out more book an appointment with Eileen Lavis or Karen Burns, Continence and Pelvic Floor Physiotherapists on 49751622 or ask at reception.